WASHINGTON — Brace yourselves, D.C. — winter is back. After a few days of unseasonably warm weather, cooler air moved into the area once again with a chance of snow on Sunday night into Monday afternoon. It’s still too far out to know exactly when and what areas will feel the most impact from this storm, but the National Weather Service highlighted a distinct possibility of a wintry mix around morning commute on Monday. Since temperatures will be at or just above freezing when the storm comes around, it’s unclear how much precipitation will be snow or rain. It all depends on the interaction of several fronts that are hanging around the D.C. region. All snow predictions at the moment come with a high degree of uncertainty, but forecasters predict the region will see anywhere from one tenth of an inch to an inch of snow by Monday, with higher amounts possible in Northern Maryland near Pennsylvania. Storm Team4 meteorologist Somara Theodore said the area might start to see light snow by 8 p.m. Sunday, changing to a wintry mix. Areas to the north may see 1-3 inches of accumulation, Theodore said, but for the D.C. area it will be more about the wintry mix. 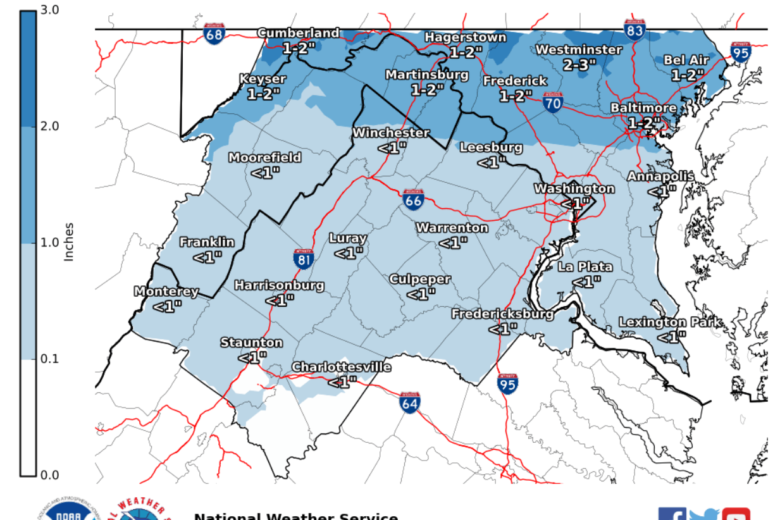 There is a chance that some spots in Northern Virginia and Western Maryland could see up to four inches of snow by Monday, but the NWS currently predicts less than a 10 percent chance of that amount of snow accumulating. More likely is that most areas see no accumulation at all, and any snow that does fall is contained to northern Maryland. Storm Team4 meteorologist Lauryn Ricketts said winter weather chances could extend through Wednesday, with the possibility of enough snow and ice to bring delays or cancellations early in the week. “Late [Sunday night] after sunset, we are looking at a wintry mix moving into our area … that’ll continue into Monday morning,” Ricketts said. Storm Team4 Meteorologist Matt Ritter said there are several outstanding factors that make predicting how exactly this weather system will effect the area difficult.